Is the Mayweather-McGregor fight something that's likely to be repeated? Will Ronda Rousey fight again? Dana White opens up on those topics and plenty more. WWE may have hijacked the word, but the UFC is nothing if not raw. When the object of the sport is to manipulate joints and execute chokes and deliver kicks like this to the head of an opponent, there’s little room for fraudulence and artifice. As the saying goes, all truths are revealed in the Octagon. But so, too, are truths revealed when speaking to the sport’s central figures. 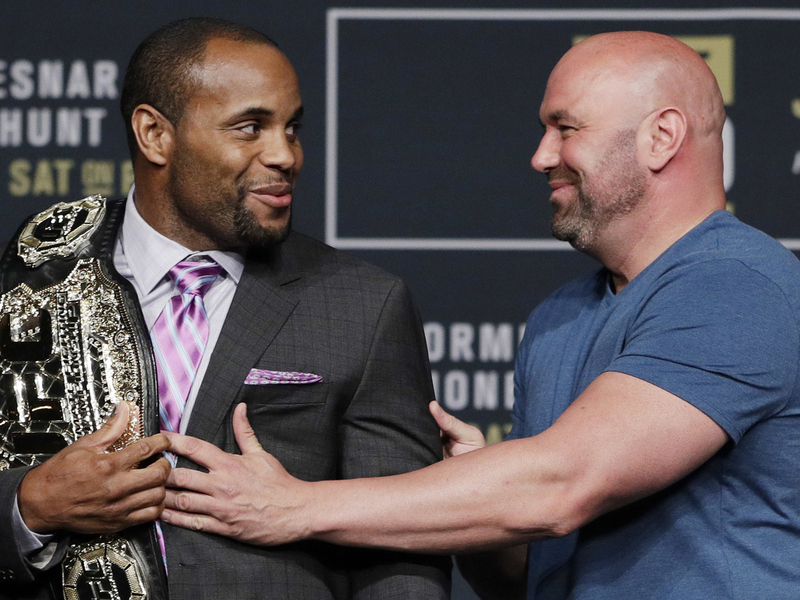 Even as it closes in on its 24th birthday, the UFC has kept its authenticity. Ask a fighter a question, you tend to get a straight answer. And the same goes for the UFC’s inimitable frontman, Dana White. Edited lightly for length and clarity, here are some outtakes from what has become a semi-annual state of the UFC conversation with White and SI. Jon Wertheim: Start open-ended. What is on your mind? Dana White: Everything's on my mind. Obviously the new Contender Series, which legitimately I love. I'll do this every Tuesday for the rest of my life. I love watching fights of guys and girls who believe they have the potential. I love it. So I would do this every Tuesday forever. Then obviously McGregor versus Mayweather, all the stuff that's going along with getting this fight put together, a lot of deals in place for the fight. Michael Bisping, trying to get that deal done. A lot of other things that Ari [Emanuel] and I are talking about and working on. Good stuff. You know, the thing is, for me, I was a little f---ed up when Lorenzo and Frank left. You know, I've been with those guys for 20 years. It felt like a divorce to me, you know. It was really hard. DW: Then moving into the new building, a lot of change for me. A lot of change. And I'm a creature of habit. But now that I put all that behind me, I'm moving forward. One of the things that I love about working with Ari is it's almost, like, I never skipped a beat. These guys want to innovate. They want to grow. They want to change things, just like Lorenzo and I always did. It's almost like I didn't skip a beat in that area. Me and Ari talk a hundred times a day, just like Lorenzo and I did. Always coming up with new sh-t, new ideas. It's fun. I'm loving it. JW: You mentioned McGregor-Floyd. As of today, this benefits UFC more than it potentially damages it? Or vice versa? Where are you on this crazy thing? DW: I don't know. I don't really think about that. I never think about, ‘Oh my God, something we're working on is going to damage us.’ It's not true. Conor McGregor, the reason he's as big a star as he is is because this kid isn't afraid to put everything on the line every single time he fights. You know, with any walk of life that you're in, there is absolutely no reward without risk. And Conor McGregor is always willing to risk it all. It's why people love him. It's why I love him. And, hey, I'm a f---ing rib kicker, so why not? As far as hurting our business, how could being a part of the biggest fight in the history of combat sports hurt anybody? JW: You think we get more of these, or is this a one-off? ​DW: I'm looking at this as a one-and-done. I don't want to be doing this every week, you know. When you're dealing with a lot of other people who, you know, are out to do what's right for their business, it makes it hard. The one thing about the UFC is we've always been in this thing for the long haul. We're in it to grow the sport, to make the sport bigger, to grow UFC, make the brand bigger, and to continue to push the envelope in combat sports and make things better for the fighters. You look at what we've done, you know, forget about the UFC and the brand and all that other stuff, the sale, all that, forget about all that stuff. Look at how big the sport has become. Look at how much more money the athletes are making. We're the first people ever, and still the only people ever, to get health insurance for the fighters. Now we just built this $12 million facility where these guys can come train for free, get physical therapy for free, and eat lunch every day for free. You know what I mean? Who the f--- in the world of combat sports has ever done that? The answer is nobody. And we still continue to build and grow and figure these things out. JW: Does Ronda Rousey fight again? DW: No. I think she's going to retire. She hasn't announced that. She hasn't said that to me, but it's what I believe. She's still going through the USADA testing, all that other sh-t, though. Listen, I've been wrong before, and I'll be wrong again. JW: To me it's kind of the fun of following a sport, but these plots change quickly, don't they? Two years ago we were in a very different place. DW: Oh, yes, we were, yup. But that's professional sports, too, you know. Look at Derrick Rose. He was one of the biggest stars in all of basketball. Looked like he was going to take Chicago to a championship. Now he's bounced around to two different other teams. One more bad season away from not being there any more. That is professional sports. JW: You have a week's detachment. How are you processing what we saw from Jon Jones? DW: Yeah, Jon Jones is the greatest of all time. This guy is the best to ever do it. Had he not had the personal hiccups he had in his life, where would this guy be right now? Who would he be aligned with outside of the octagon as far as sponsorship goes? Would he be the heavyweight champion of the world right now, too? What would he have accomplished if he didn't go through these personal issues in his life? JW: What's next for him? DW: I don't know. You know, he came back. He did what he did with Daniel Cormier. Letting him take some time with his family and stuff, and we'll go after what's next. JW: Who is the best fighter that's caught your eye that the average fan might not know about? 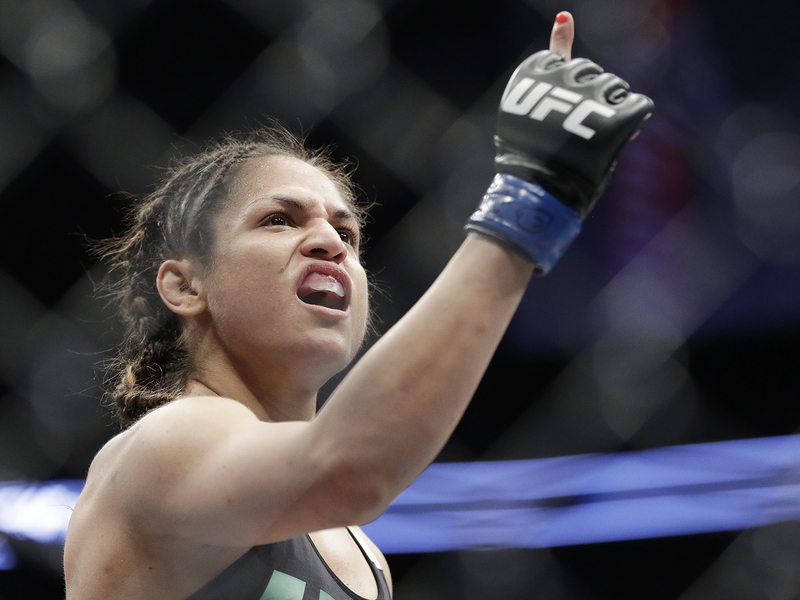 ​DW: Oh, right now I'm all about this girl Cynthia Calvillo. She's 115 pounds. Comes out of Team Alpha Male. I'm predicting she's going to be the next big thing. JW: Best-case scenario for these media negotiations? DW: The best-case scenario? Listen, if you're in my position, right, you have some of the most compelling live content in all of sports. We're global. We're continuing to grow. Let me put it to you this way. I hate to kick boxing in the nuts again, but they make it easy. You know, every time these guys put on a fight, it's a going-out-of-business sale. Let's get as much money in the door as we can, and let's not think about the future of the sport, right? If you look at what we do, you know, HBO. HBO is absolutely, positively the gold standard in boxing. They haven't changed a thing since the '70s. The only thing that's different is HD. Looks exactly the same. Feels exactly the same. These guys are winning f---ing Emmy's. For what? For what? They don't f---ing innovate or change or do anything. Even the f---ing commentators are the same. It's unbelievable, right? Now, if you look at what we do from The Ultimate Fighter, Looking For a Fight, the Contender Series, and our product, the UFC, what they continue to do? We continue to try new things, continue to innovate, continue to change with the times. We were the first to jump into social media, virtual reality, 3-D, this, that, all the different camera angles, different types of cameras. The Embedded series. Dana White's Video Blog. The f---ing list goes on and on of all the ways we continue to innovate combat sports. And they do none of that. ​JW: One thing that was interesting about [Joe] Rogan's interview with Cormier the other night: For all the talk about head injuries in sports, we actually saw what a concussion looks like in real-time. JW: We hear about the NFL. Where are you with head injuries in [the UFC]? DW: When you talk about that, right, when you talk about the NFL. The NFL was hiding the information that they had obtained about head injuries, about concussions, and about [traumatic brain injuries], head trauma, all these other things. We do the exact opposite. Obviously I think there was that feeling or this belief that because they wore pads and helmets, they were being protected from that. But that wasn't the reality. The NFL knew it. The NFL hid it. Nobody comes into a combat sport thinking getting punched in the head is good for you, you know? But what we've done is we've been working with the Cleveland Clinic. We're doing all these studies on brain injuries, how to prevent 'em. The difference with the NFL is, if Brady gets a head injury, right, you can't pull him out for the season. You can't do it. You guys need Brady. Or your running back, this guy, that guy. That's not the case for us. First of all, they only fight three times a year. They're being evaluated by doctors. You absolutely, positively do not go back into fight unless you're cleared by a doctor. It's been like that since day one for us before all the head injury sh-t came out, you know? I think we're way ahead of the game when it comes to that, just like everything else. DW: They've shown that headgear doesn't do anything for brain damage. All headgear does is keeps you from getting cut. Actually think that headgear is actually worse. But, yeah, we're continuing to push the envelope and figure more about brain injuries and everything else. But at the end of the day this is a sport where you know that that's absolutely, positively part of the game. And the bad things that can happen to you later on in life from head trauma, everybody knows it. As grown adults, they make the decision to get into the game or not get into the game. JW: What was the thought process behind the Dana White Tuesday Night Contender series? DW: Well, two things. First of all, I love to do new things that have never been done in the fight game, try new stuff. And obviously having this Contender Series in the TUF gym, pretty much we let some family and friends in, but other than that it's me and them, man. That's it. And SnoopCast. I love SnoopCast. Something, again, different, innovative. Not your typical play-by-play, but Snoop's always wanted to call a fight. Then I started thinking about this show, how I would do it. I was like, Why not just let Snoop be Snoop? Snoop is hilarious. He's funny. It's different than anything that's ever been done, you know. JW: What have you learned about desperation? DW: I don't know. I don't know if it's desperation. I think it's more about opportunity, you know? Everybody wants to be looked at. Everybody feels they're the best and have the potential to be a world champion. Everyone has a trainer who thinks he is the best, meaning their fighter, their fighter is the best. Everybody. This is an opportunity, there's a lot of talk. A lot of people like to talk. A lot of people like to say this. Then when the fight's over, there's always a lot of excuses. Sheer opportunity. Here is your shot. I'm sitting right here. You have my undivided attention for the next 15 minutes. What do you got? 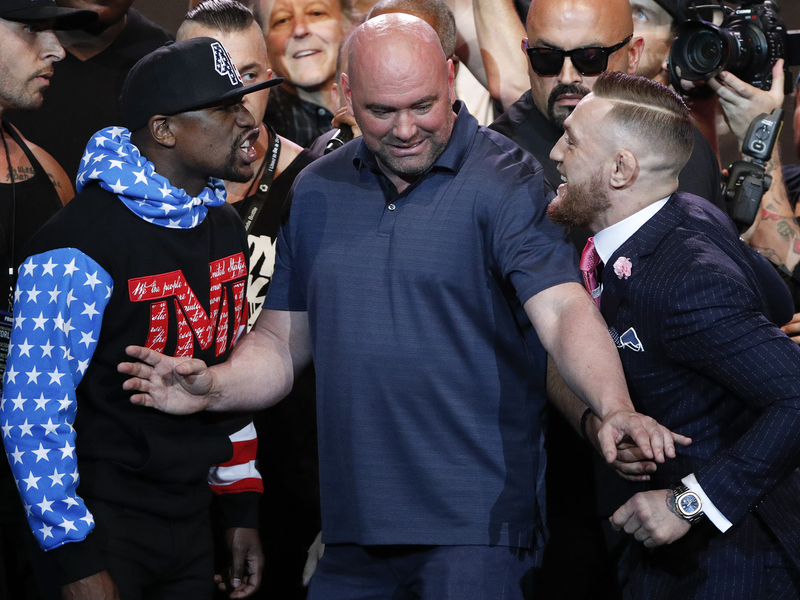 ​DW: I think the hottest topic, the most relevant thing right now is Mayweather and McGregor. This thing is going to be the biggest fight ever. Think about this, right? The biggest Super Bowl ever in the history of the Super Bowl did a gate of $103 million. The gate on this one is $100 million. That's in a stadium. This is in an arena. JW: I'm going to push back a little on that. JW: You just had a great show [at UFC 214]. You got close fights, men, women. Jon Jones at his best. That card was UFC at its best, as far as I'm concerned. JW: And the takeaway of the summer is going to be Floyd and Conor. We all know what comes with that. JW: I'm worried that MMA doesn't get the better end of this bargain. DW: I don't ever worry about that. At the end of the day, if you look at the sport right now, we're in its infancy. Look at boxing and every f---ing fight is like a going-out-of-business sale. I just laid out 15 different things that we're doing to continue to grow the sport. Look at what Conor McGregor has done for this f---ing company and what he's done for this sport. I say it all the time. If you look at what this kid has done for the sport and for this f---ing company, how do I not let him take this fight? How do I say no to this? The kid can change his family's life forever, and I'm going to f---ng stop it because, you know, it's Floyd Mayweather in a boxing match? No way. No way. It is what it is. At the end of the day my job is to put on the biggest fights ever, you know? And to put on the fights that the fans want to see. That's my job. Conor wanted this fight. I'm going to make it. I don't think we get the short end of the stick. I think Conor does much better than people think he's going to f---ing do. I've been watching him spar. I think he's going to do a lot better than people think. ​DW: Let me tell you this. Let me tell you this. DW: When I just talked to you f---ing 15 minutes ago, I told you nothing in life, you don't become successful unless you take f---ing risks. DW: Now, as a businessman, if that's the way that I thought, what would I do? What would I achieve? How much success could you really have if that's the attitude? I get it. That's your job. Your job is to look at the negatives and this and that. But all the negative things that are being said by everybody about this is exactly what sets up the biggest upset in the history of f---ing sports, ever.